As part of its commitment to supporting schools' and teachers' professional learning, ACEE and Rocky View Schools' learning specialists created the Rocky View Action Cohort. The Action Cohort brings together school teams for a two-day session. Each team includes an administrator and three to five teachers, and they spend their time learning and planning for leading a transformation for environmental stewardship. The teams learn about transformational leadership, environmental inquiry and environmental stewardship and work on a plan for their school. The buzz in the room as the teams work on their plans is audible - the teams are focused, engaged and utilize their team planning time extremely well. The Rocky View Action Cohort has 22 schools participating - 12 from year 1 and 10 from year 2. What did teachers and administrators say about the RVS Action Cohort? What have the schools accomplished? Transformational leadership encompasses four dimensions to create change that involves teachers, administrators and the community to enhance student learning. All four areas were covered during the two-day session and the school teams worked on an action plan to move forward in each of these areas. Building Community In successful Green Schools, teachers bring in education resources from the community – so ACEE introduced some of these groups to teachers at the workshop! ACEE sends a big thanks to these groups: Alberta Beverage Container Recycling Corporation, ATCO Energy, CAWST Youth Wavemakers, Classroom Energy Diet, ConocoPhillips’ School Environmental Quest, Destination Conservation, Fish Creek Provincial Park, Green Calgary, Grounds for Change, and Inside Education. What did the administrators and teachers say about the Action Cohort? The school teams felt better prepared to lead a transformation for environmental stewardship - increased from 57% before the session to 90% after the session. 100% of participants stated that this addressed their teams needs, that they made progress on their goal and they are ready to implement actions outlined in their plan. 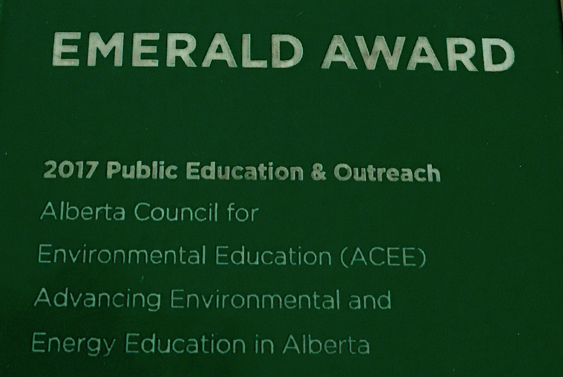 ACEE will support the school division with additional environmental education professional learning, including their participation in the Alberta Green Schools conference stream, where we'll recognize and celebrate their accomplishments. The learning specialists at Rocky View will offer support to help schools engage theirs students in environmental inquiry learning. Deb Rougeau-Bell as the Mentoring Specialist will continue to support administrators in advancing in all four dimensions of transformational leadership.